Due to technological advancements, light utility vehicles, sometimes misclassified as “golf carts,” are becoming increasingly functional in municipal fleets. 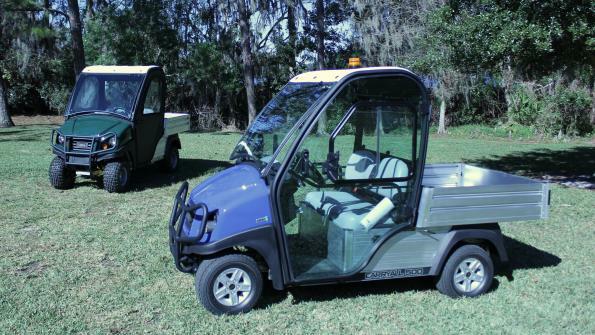 The term “golf cart” is really a misnomer when applied to the scores of highly-functional, light utility vehicles joining municipal fleets across the country. Though small in stature, these pint-sized workhorses are beginning to fill the gaps in fleets where manpower isn’t enough, but full-sized trucks would be impractical or cost-prohibitive. Productivity aside, by adding the right vehicles to a fleet, managers are seeing positive returns, both economically and environmentally. At the release of their new Carryall series, representatives for Club Car, a manufacturer of golf cars and light utility vehicles, demonstrated the functionality of such vehicles for municipal fleets. “There is a wide range of [municipal] applications we’ve seen,” Kurt Meyer, the commercial and industrial marketing manager at Club Car said. He added municipalities use carryalls for parks and recreation departments, grounds maintenance, event coordination, sanitation as well as in wastewater treatment facilities. “We say [applications range from] airports to zoos,” Meyer said. A benefit these departments see by switching is a decreased environmental impact. Averaging just under 40 miles to the gallon, gas-powered Carryalls are more fuel efficient than traditional work trucks, cutting down on the carbon emissions generated from exhaust. Electric vehicles, of course, generate no emissions, and making this switch is often incentivized by state and federal initiatives. For more information on these vehicles, watch Derek Prall’s ride-along with Kurt Meyer below.